MK Yoni Chetboun (Yachad) on Sunday morning 3 Adar attended an election event in a Ramat Gan school. 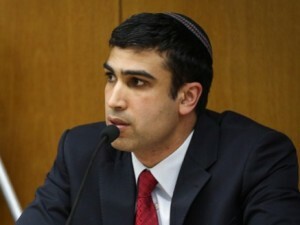 During the event Chetboun spoke out against the Labor/The Movement ticket in the 20th Knesset elections. “The left has grown tired of the state, fed up. They are always pessimistic and life is not good for them here. They are fed up with the nation but I have news for the left. You do not have a partner for this tired feeling. Am Yisrael loves the state, and wants Jewish values and is not ashamed of this. Am Yisrael is stronger than this. The State of Israel is strong and does not break and will not give up to the Arabs”. “We of the Yachad party for the first time in the state’s history have chareidim, dati leumi and traditional Jews working together around our Jewish values. I see so many flags here; blue & white, Magen David with blue stripes flying in pride. This is our flag, the flag of Yachad and we are not ashamed of our values”. The “left” wanted a state where they could live in peace as goyim without having the problems such a lifestyle encountered in Europe. The zionist dream was to be an עם חופשי, free from the yoke of Torah and mitsvos. They came close to that in the first generation of Israeli independence, and now feel alienated by the fact their country has been taken over by Jews. To the left, if they wanted to be Jews, they would have stayed in golus. I’m not saying the zionists were clever. They assumed all frum Jews would promptly “see the light” and give up being frum when offered a country where they could do so without having to pretend to be Christians. They also assumed the Arabs would welcome them and join in their socialist and secular revolution. However we need to understand them and try to see where they are coming from. It’s not that they tired of Israel and Zionism, its that their Israel and their Zionist movement was, from their perspective, hijacked.